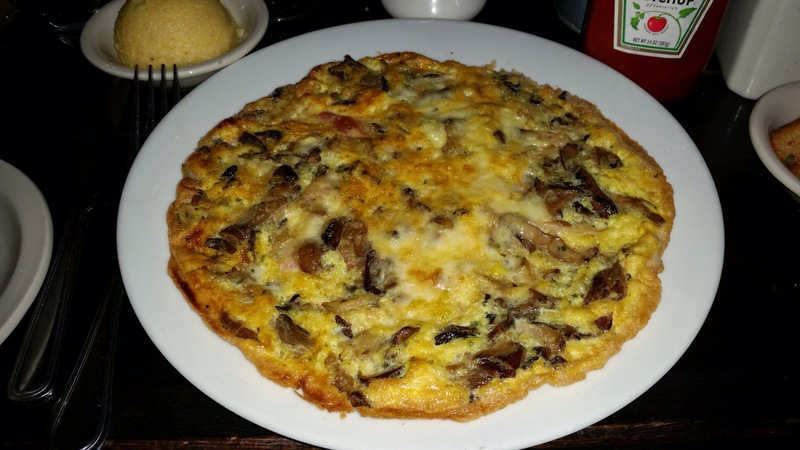 FRITTATE ITALIAN-STYLE OMELETTES RUSTICA: Italian bacon, mushrooms, artichokes, smoked mozzarella. Doesn’t this frittate look good? It looks like a big moon pie but with eggs. All the fillings are what would go well on a pizza. This feels like eating a big egg pizza for breakfast which is an indulgence for a Sunday morning. 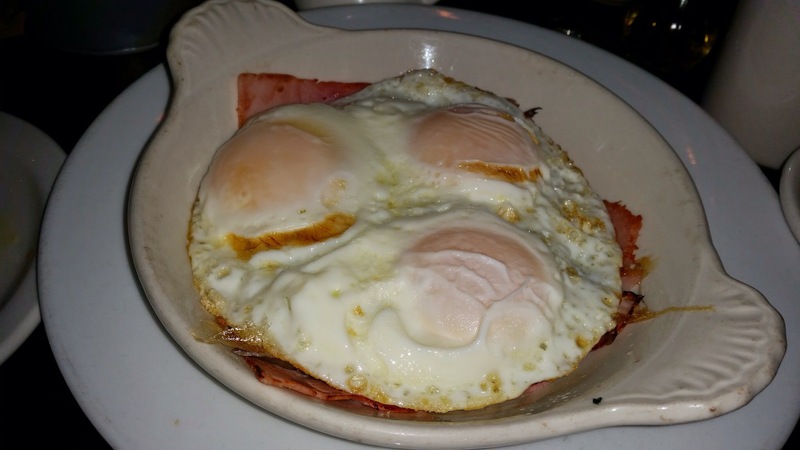 3 EGGS IN A BAKING DISH with mushrooms and ham. MMM. The photo of the baked eggs looks like a mummy head. If you look closely, the three egg yolks form the face of a bandaged man who has two big bulging eyes and one big open mouth. 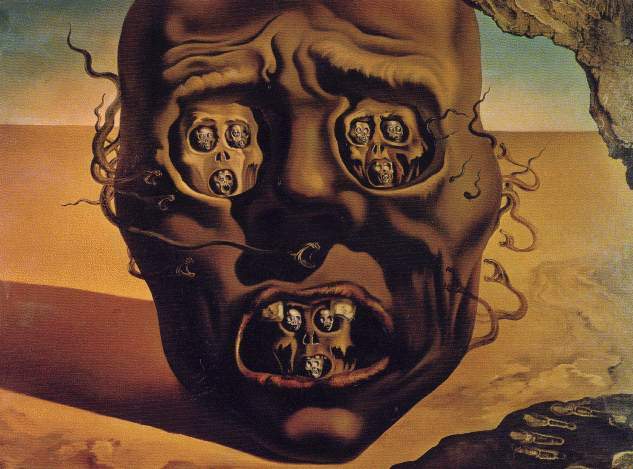 It reminds me of Salvador Dali’s painting – Face of War. See below. Regardless of how the dish looked, it was delicious. The ham, mushroom and egg combo was a winner. I am somewhat biased because this combo consistently works for me in many forms. 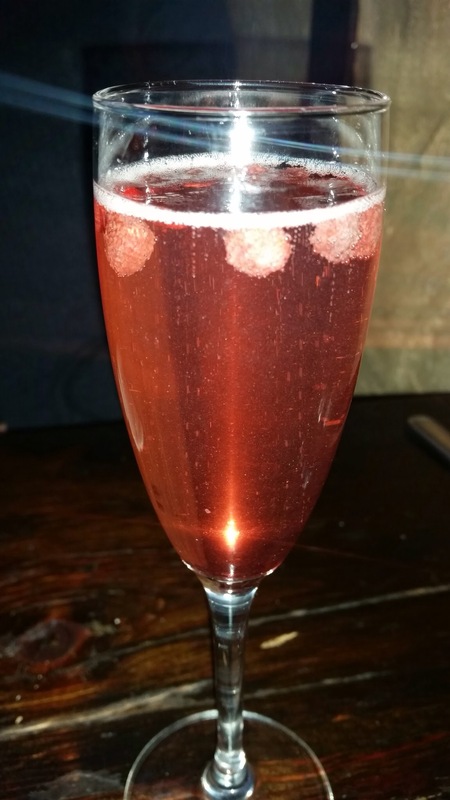 FRAGOSA: prosecco, fragoli wild strawberry liqueur. Now, this is the fun part of the brunch. I recall between my friend and I, we had three to four glasses of Fragosa. It was fruity, the strawberries were cute floating on top, and we got pretty silly with the alcohol. Fragosa was a nice companion to the eggy dishes. Back to the high energy angle, my friend and I sat in the backyard patio. It was a small enclosed area but filled with easily over forty people. Tables were close to each other. People, mostly women, were talking loudly over each other. The music from the 80s was piped in loudly from the speakers on the wall at each corner. There were a lot of utensils clinking, dishes dropping, and wait staff’s quick footsteps. It was a cacophony of New York at its Sunday best. Next Next post: Krolewskie Jadlo (King’s Feast) in Ridgewood, Queens, NY – Hearty and Homey. My 100th Post!